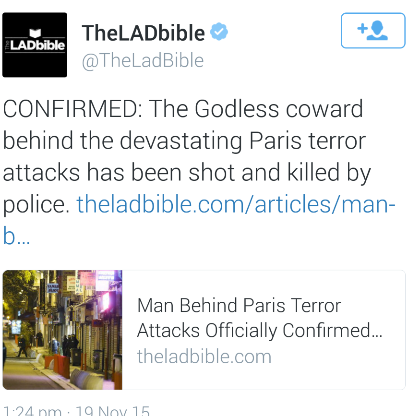 Well, of course we shouldn’t rely on ‘The Lad Bible’ for sensible commentary on world events. They are a click-baiting social media enterprise with a penchant for taking other people’s content without permission or attribution. Worse still, they threaten bloggers with legal action for pointing out as much. Given I possess more than a few brain cells, I’ve never been a fan of ‘Lad culture’, and I have even less patience for ignorance of this kind. Sure, this is trivial in the grand scheme of things, but it also serves as a reminder. Despite how much progress has been made in humanistic circles, nonbelievers as a minority are still considered somewhat ‘evil’ in mainstream circles. Take a moment if you will to consider that the individual behind this post grasped for a suitable pejorative to describe a terrorist murderer and settled on ‘Godless’. The insult aside, those responsible for these atrocities were some of the most godly people on the planet. I’m not sure what else they would need to do to in order to convince a sensible person of their sincerity. Perhaps I’ve misread The Lad Bible, and they were simply conveying what nonbelievers have known for some time: everyone is Godless.